In life, I am kind of a "no nonsense" kind of gal. Not in the "you can't be silly" kind of way, but in a "let's just get to the bottom line" kind of way. Which is exactly what No Nonsense Algebra, from Math Essentials is all about. The lesson are short and to the point. They ask that you only spend 20 minutes a day working through the lesson. That is super easy during regular school time, a little bit tougher when you are officially on summer break. But, I did make D-man cooperate with this. I won't reveal my methods. 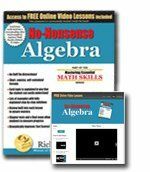 We got the No Nonsense Algebra textbook to use, but a bonus is that you also get a code to use for watching on-line video tutorials. The video tutorials move quickly, so you may need to hit your pause button to give yourself a minute to think. But, that is the whole concept....no fluff.....no nonsense. Like I said, I really am a "No Nonsense" kind of person. I like people to just get to the point. I am not good in meetings because there is too much....talking going on....and not about the thing we are supposed to be there talking about. When my kids ask for things, I hate it when they talk around in circles trying to get me to come out and say what they apparently are too afraid to ask! Just spit it out! I know. That will illicit more groans and moans from your kids. But, the author assures me it will be worth it. How do you actually work through a lesson? You start with the video for each lesson. Then you read everything that is on the lesson page (each lesson is really only one or two pages long - don't worry), then you work through the examples (yes, I said work through them, don't just read them), then you move onto the work the exercises on your own, then you review. There is an answer section at the back of the book. But, instead of just marking things wrong, they want you to rework the problems so you can see where you went wrong. After you do this, you are ready to move on to the next lesson. D-man said that he liked that the lessons got straight to the point and he could just get on with it. He didn't really love the lecturer's voice in the video. But, Rainman and I told him that was just another way to prepare him for college. Not all of his professors would have the sweet sounding voice of his mother. You can use this as a supplement to your algebra curriculum, but it is really designed to be a concise curriculum all on its own. We are planning to use it as a general Algebra review before moving D-man onto higher math. We feel comfortable that this will catch anything that our teaching may have missed. So, when he completes No Nonsense Algebra successfully, we are confident he can move on without issues. Once A-girl gets to Algebra, we plan to use this as her actual curriculum. It is much better than the hodge podge algebra that D-man got from us! Use Rick Fisher's Mastering Essential Math Skills for 20 minutes a day as directed. If you don't see what you feel are dramatically improved math test scores, send us a note saying so. You'll receive a prompt, complete refund - no questions asked! Did you get that? A refund. No questions asked. We also got to pick a bonus book from the Mastering Essential Math Skills set to try out. I picked Problem Solving. Seriously, I still panic a little bit inside when the kids ask me for help with their word problems. One of my Review Crew friends said she worked through this book for herself and.....she gets it. She really gets it! .....after I try to earn $45 this week so I can use one-third of my earnings to buy 30 pounds of candy that I will then give three-fifths of to Hank, my neighbor, who is paid $12 an hour. How much candy and money will I have left? 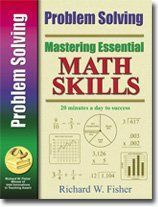 Will I have enough to buy another Mastering Essential Math Skills book which costs, $11.95? Read what other members of the Review Crew thought about there Math Essentials products. Disclaimer: We received copies of No Nonsense Algebra and Problem Solving for free in exchange for an honest review.